A non-abrasive polishing and buffing pad. Use with one of our floor polishing solutions to bring back a high-gloss finish to you floors. 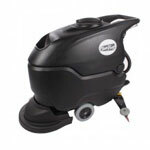 For use on our 12 inch low speed floor machines, or our 24" automatic scrubbers. The prices are excellent. We will continue to order here. Does the job: Distributes evenly the wax on the floor, but it does not bring out the shine to waxed hard wood floors.